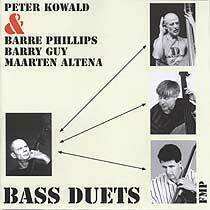 Peter Kowald, bass, in duo with: Barre Phillips, bass (tracks 1-4); Barry Guy, bass (tracks 5-6); Maarten Altena, bass (tracks 7-10). Tracks 1-4 recorded live during the Workshop Freie Music at the Akademie Der Künste, Berlin, on 1/2 March 1979; tracks 5 and 6 were recorded on 3/4 October 1981 at The Flöz, Berlin; tracks 7 to 10 were recorded on 19/20 March 1982 at the Akademie Der Künste, Berlin. Cover design (reproduced above) by Kowald & Jürgen Schäfer (for Arakawa); cover photographs by Ros Ribas. This CD, released in December 1999 includes selections from FMP LPs: FMP 0680 Die jungen: random generators; FMP 0960 Paintings; and FMP 0990 Two making a triangle.